BTField is a real-time data acquisition and classification system for unexploded ordnance (UXO). It has been designed to meet the needs of both data collection crews and geophysicists by allowing processing and inversions to run simultaneously as data is being collected. It is a 64-bit, networkable solution that can be flexibly configured to consume sensor data from multiple COM and/or TCP streams. Multiple users can establish a connection to the BTField SQL Server database and work in either a real-time acquisition and processing mode, or a post-processing mode. The SQL Server database is highly scalable, allowing for the attachment of multiple storage drives to hold significant volumes of geophysical data that can be queried and re-processed with different settings if desired. Each Data Acquisition (DAQ) project in BTField defines a sensor platform configuration as well as the data parsing logic that consumes the sensor data. Four levels of nested parsing settings provide the flexibility to consume almost any data stream with a known data format. 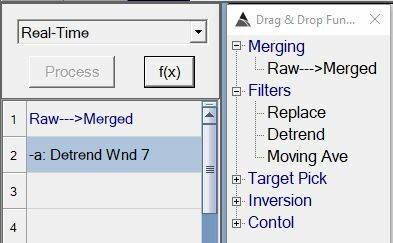 An intuitive drag and drop interface allows easy configuration of processing flows that can be used in either real-time or post processing modes. For any BTField DAQ project, each machine can be configured with data views and indicators that suit the user's visualization requirements. For example, a data collection machine's views may be configured quite differently than a data analysis machine's views. Multiple BTField computers can connect (wired or wirelessly) to the central Control Computer that runs the SQL Server database. In real-time processing configurations, the Control Computer will collect data while allowing other client computers to join the active survey and receive the real-time data. The client computers joined to survey can then toggle tracking on or off to immediately invert anomalies of interest. Alternatively, non-joined clients can simply refresh an opened master survey for the site to begin analyzing the most recent data. BTField's SQL Server database can be configured easily with multiple drives to store significant volumes of geophysical data. Data can be re-processed using different processing flows and output to different data states, leaving original processing and inversion results unaffected and available for direct comparison. BTField's data simulator allows real-time playback of previously captured data streams to assist with sensor stream verification testing and development.